A Kent town's artistic community has stamped its character all over a derelict Victorian building. Swedish artists Akay and Peter used off-cuts of paper from a mill to transform Ashford's Toy House into a "huge three-dimensional Post-it board". 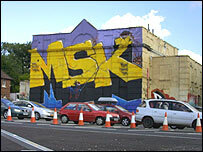 It has since been covered in graffiti, murals and messages. Ashford artist Oliver Winconek said: "Some of the graffiti has been seen as perhaps not ideal, but some of the artwork is very clever and striking." The Toy House is a well-known building near Ashford railway station, situated on the corner of Elwick Road and Station Road. "I did a piece on there a couple of weeks ago," said Mr Winconek. "I think we have made it look better. It's a talking point and people are coming to see it." He said that the paper from Aylesford Paper Mill had been "literally put on there almost like wallpaper" before the graffiti artists moved in.